It’s been a rough week for electronic music — having lost Bebe Barron, we’ve now lost one of the other great early pioneers of electronic music, South Australian Tristram Cary. Tristram is credited by some as the father of tape music, originating tape music techniques in World War II. He’s notorious to the general public and sci fi fans as the composer of the music for the Daleks in Doctor Who (along with other music) — like an evil counterpart to Delia Derbyshire, who built the studio Cary would later use. But he was also a pivotal composer of music for film, electronics, voice, and instrument alike, a well-known Australian music critic, a leading figure in studios and academies, and, oh, yeah, he did the visual design (product design, really) for the legendary portable VCS3 "Putney" synth from EMS, the synth maker of which he was a founding Director. 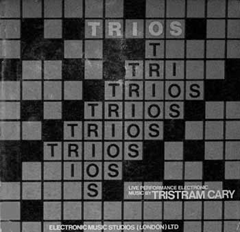 It’s safe to say that, out of this web of contributions to electronic sound, Tristram Cary is another of those people who charted the course for what music technology is today. From the technology to his extensive music to his work in popularizing musique concrete in England, his impact is felt even by those who don’t know his name. Christian Haines writes to let us know of Tristram passing, evidently following a long illness. If you don’t know his work, there’s no time like the present to discover what he’s given us. And, you know, looking at all of this I’m reminded of why things like the Dalek connection are important. For whatever reason, mysterious science fiction worlds have been the entry point for listeners around the world into the sometimes alien and frightening new timbres of electronic music. We’re all lucky enough to have grown up in a time in which we’re challenged to create music that evokes other parts of the universe, real and imaginary. How do you make a robotic pepper pot threatening? Hire a great composer, and watch children dive behind the couch. Photo: zoomar. Tristram was born in Oxford on 14th May 1925. He served in the Royal Navy from 1943-6, specialising in radar and thereby receiving training in electronics. During his war service he independently developed the idea of what was to become tape music, and began experimenting as soon as he was released from the Navy in late 1946. From 1954 he found himself able to live by score commissions, and from that time produced a large variety of concert works and scores for theatre, radio, film, TV, public exhibitions etc. He was founder (in 1967) of the electronic music studio at the Royal College of Music, and designed and built his own electronic music facility, one of the longest established private studios in the world. The equipment from this studio was brought to Australia, and most of it was incorporated into the expanding teaching studio at the University of Adelaide. He was also a founder Director of EMS (London) Ltd, and co-designer of the VCS3 (Putney) Synthesiser and other EMS products. He called upon a wide range of resources for generating film, TV, theatre, radio or concert music, special dialogue treatments, or anything in the area of specialised sound. His wide experience as a composer included all aspects of instrumental and vocal ensemble, any facet of electronic music, or combinations of several types. Tristram played a pivotal role within the Elder Conservatorium until 1986, when he left the University to resume self-employment. During 1988-90, he was largely occupied with writing a major book on music technology which was published in London as The Illustrated Compendium of Musical Technology in May 1992 (Faber & Faber). The American version – substituting Dictionary for Compendium – is distributed by Greenwood Press, Connecticut. In 1995 and 96 there were performances in London and Adelaide to mark his 70th birthday, and a new suite based on his music for the Ealing film The Ladykillers won The Gramophone Award for best film music CD in 1998. Apart from composition activity, Tristram was a respected music critic for The Australian newspaper. In recent years he held the position of Honorary Visiting Research Fellow at the University of Adelaide, in which capacity he continued his computer music research. In 2001 the University also conferred on him the degree of Doctor of Music. In 1991 he was awarded the Medal of the Order of Australia (OAM) for services to Australian music. In 1999 he received the SA Great Music Award for the year, and Symphony Australia commissioned a new work – Scenes from a Life – to mark his 75th birthday in 2000. He received the Adelaide Critics Circle 2005 Lifetime Achievement Award on December 5, 2005. Monomists, Unite: Monome Mavens Meetup in Princeton; Will You, Too?